You don’t gain wrinkles in your skin – you lose collagen. DOT (Dermal Optical Thermolysis) Therapy Fractional laser treatments work with your natural facial structure by targeting the layers in the skin that produce collagen. While injectable wrinkle reduction treatments using toxins like Botox can alter a person’s expression, DOT Therapy treatments help to stimulate new collagen under the skin that restores the structure of the skin and delivers a more natural looking result. DOT therapy uses hundreds of tiny pillars of laser energy to penetrate the skin and stimulate the body’s natural collagen production. The laser ablates a small percentage of the skin while leaving healthy tissue in between so the skin can heal faster. The laser delivers enough heat to stimulate the production of new collagen while leaving the skin able to heal in a few days. 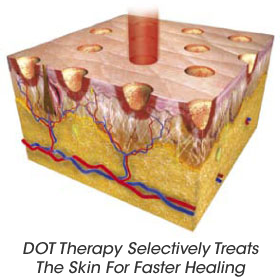 DOT Therapy allows treatment parameters such as treatment area shape, depth of ablation, overall heating and downtime to be tailored to the patient’s skin and lifestyle. Rather than a ‘one-size-fits-all’ approach the doctor can, for example, change the shape of the DOT pattern to suit the shape of the body part being treated and minimise areas of treatment overlap, or alter parameters related to the strength of treatment to match the desired results or downtime to the patient’s lifestyle. This is particularly important when treating delicate areas such as the wrinkles around the mouth or eyes.